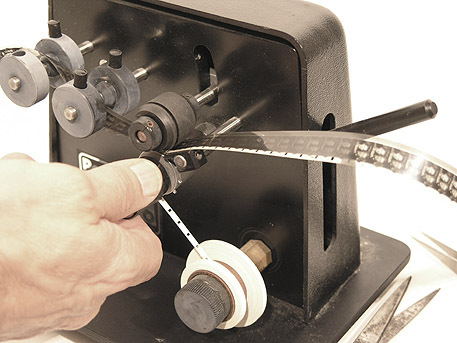 Inspection, cleaning and repair of worn 16mm film prints. Magnetic soundtrack transfer. Vinegar Syndrome. Tape shed, etc. By Quotation. Torn 16mm Positive Print with variable density soundtrack. Perforation damage to 16mm feature Positive Print with variable area soundtrack. The perforation holes have been stretched and pulled. 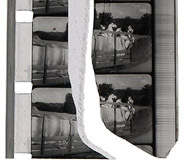 Damage such as that shown above makes the film unprojectable. Damaged perforations being restored using special repair tape. 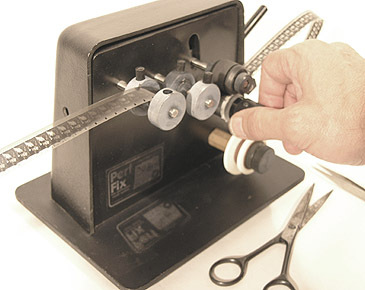 Guide rollers accommodate the film path and present the film to a rubber pinch roller with a small sprocket wheel below it. The sprocket wheel takes up the 16mm perforated adhesive tape from a feed roller. The repair tape can be seen emerging on the underside of the film. The damaged film section is turned over, and the other side fed once more through the tape sprocket to complete the repair.